What is the 2-Meter Amateur Radio band anyway? According to Wikipedia, “The 2 meter amateur radio band is a portion of the VHF (very high frequency) Spectrum, comprising of frequencies stretching from 144.000 MHz to 148.000 MHz.” These communications are generally FM or frequency modulated transmissions although some operators do operate using SSB (single sideband) or CW (Morse code). These modes of operation allow for longer distance communications without the use of repeater stations. While listening to the 2-meter ham band you can expect to hear normal conversations or “rag chew” as the hams call it. You may also hear a ham operator on his way home from work asking his wife if she needs anything from the store. You may hear a ham operator reporting a traffic accident and requesting emergency services. You may also hear ham radio operators providing on the scene emergency communications during times of disaster. Often you will hear a ham operator reporting on conditions long before the general public has been advised of the situation via the normal news media. Even before you hear the information listening to a police or emergency services scanner you have already heard about the situation if you are monitoring the 2-meter ham band. Ham Operators coordinate emergency efforts. SSB (or Single Side Band AM) transmits in long distances. The 2-Meter Ham band can have similar type local broadcasts but is normally much clearer audio and is FM. The 2-Meter Amateur band frequencies are reserved for the exclusive use of those licensed in the United States by the Federal Communications Commission (FCC) as Amateur Radio Operators or “Ham Radio Operators”. Ham radio operators use the 2-meter band for general conversations as well as for emergency communications. Ham radio operators are often the first called upon to assist in major disasters with communications between the public and emergency services such a law enforcement, fire and emergency medical services. The American Red Cross has recognized that the 2-Meter Amateur band is a very effective way of providing communications during times of emergency and Ham radio operators provide 90% of the coordination efforts during a major emergency. During an emergency a 2-Meter band receiver could save your life or that of a loved one. How does the 2-Meter Amateur Radio Band work? In most communities, the local Ham radio operators own and maintain repeaters on the 2-meter band, which assists their communications by increasing the distance that they can communicate with each other while still maintaining the quality of an FM transmission. These repeater stations are located in high locations such as mountaintops or tall buildings in the big cities and consist of a powerful transmitter and a high-gain antenna allowing Ham operators to extend their coverage areas, often as much as 200 miles or more. These stations often have alternative forms of power such as generators, solar power and batteries, which keep them in operation when the commercial power supply has been discontinued due to weather or other disasters. Individual ham operators have also found alternative power sources for their equipment so that they can operate even when there is no commercial power available. Ham radio operators are very inventive in their approach to communications and can often find a way to communicate when normal communications such as cell phones have been interrupted. As an example, Ham radio operators have been able to make phone calls using the 2-meter band for many years before the invention of the cellular telephone. 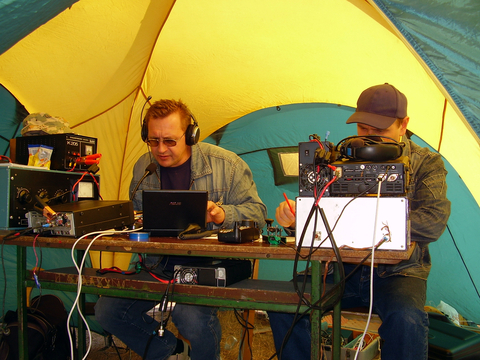 More information about the 2-Meter Amateur Radio Band. Because it is local and reliable, and because the licensing requirements to transmit on the 2-meter band are easy to meet in the United States and many other countries, this band is the most popular Amateur Radio band in the United States. The 2-meter band is often the band on which Ham radio operators make their first contacts. Obtaining a Ham operator’s license consists of taking a simple test containing 35 questions covering such topics as operating procedures, rules and regulations and some minor electronics theory. There is no requirement to pass a Morse code test to be licensed to operate on the 2-meter amateur radio band. 2-meter radio equipment is also very affordable and can be as simple as a small hand held transceiver or a powerful base or mobile transceiver. This popularity also means that it is the most often used band for emergency communications such as providing emergency communications between Red Cross shelters and local authorities. Many neighborhood disaster relief organizations use the 2-Meter Amateur Radio band for their official communications during times of emergency. To learn more about 2-Meter Ham radio and what is required to obtain a license contact the ARRL (American Radio Relay League) at http://www.arrl.org or call (860) 594-0300. They can provide you with local contacts for training classes in your area and test dates and locations. Your local Amateur Radio Club members will assist you in all aspects of obtaining your license including what type of equipment you need to get started. Also a gentleman named Gordon West would love to help you get started in ham radio. He has a school you can attend in Southern California (Gordon West Radio School) or you can order study materials from the W5YI Group at www.w5yi.org. Bob Crane recommends Gordon West’s course materials as they are extremely well written, while making it enjoyable to learn. Mr. West will even take a phone call if you have a question. Also take a look at our C. Crane blog post The Importance of HAM Amateur Radio by Tim Carter, Ask the Builder . He has a great story about Ham Operators and how important they are in aiding in emergency efforts. You will discover that Ham radio operators are a great bunch of people. They provide this irreplaceable public service for free. Technician Class: 2006-10 FCC Element 2 Amateur Radio License Preparation – By Gordon West WB6NOA.